Oh me oh my, it's a mystery! What oh WHAT could the secret ingredient be? I saw this recipe in Food Everyday: Martha Stewart Magazine and was intrigued by the "mystery" in the title. Mysteries are always exciting, right? I read through the recipe, and I loved what the mystery ingredient was. I made the cookies almost immediately! I ended up bringing most of these to work with me, and it was fun to hear what people thought the mystery ingredient was after they took a couple bites. I got all kinds of guesses! And here it is! The mystery ingredient. An assortment of miniature candy bars. Genius! Coarsely chop 16 miniature candy bars. I used exactly what you see in the above photo: Twix (4), Milky Way (4), 3 Musketeers (4) and Snickers (4). I'm sure any kind and any combination would be just as wonderful. And these were wonderful. Cut 20 caramels in half. Set the candy bars and caramels aside. Beat on high until fluffy and pale, about 3 minutes. Beat in 2 large eggs. With mixer on low, beat in the flour mixture in three additions until combined. Fold in caramels and candy bars. On parchment-lined baking sheets, press cookie dough into 2-inch circles, 2 inches apart (9 cookies per baking sheet). Bake for 8 minutes in the preheated oven. 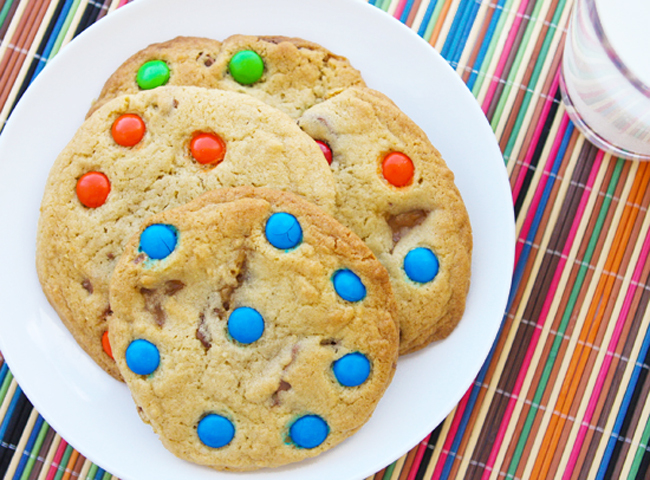 Remove from the oven and press M&M's candies onto cookies for decoration. Return the baking sheet to the oven and bake for 8 to 9 additional minutes. Remove from the oven and let the cookies cool completely. Getting the cookies off of the parchment paper without breaking them was a bit tricky. The caramel that seeped onto the bottoms of the cookies (uhh, yum!) liked to stick to my spatula. And then to the cooling rack. One thing that helped was using a metal spatula and loosening the perimeter of each cookie before trying to completely free it. I generously sprayed my wire rack with cooking spray before transferring them, as well. I have to tell you that these were totally delicious little treats. I loved the different flavors from the different kinds of candy bars. It's 3 Musketeers! No, wait! It's Snickers! No, caramel! Looking for a cookie more geared for the sophisticate pallet? Try out my Salted Caramel Refrigerator Cookies all the caramel flavor, but a little more "grown-up!" Preheat oven to 350 degrees F. In a large bowl, whisk together flour, salt and baking soda. In a large bowl, using an electric mixer, beat butter, sugars and vanilla on high until fluffy and pale, about 3 minutes. Beat in eggs. With mixer on low, beat in flour mixture in three additions until combined. 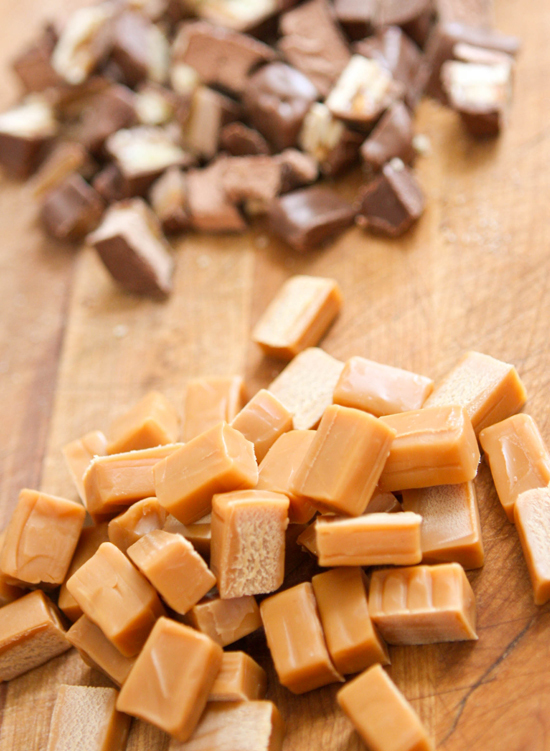 Fold in caramels and candy bars. On parchment-lined baking sheets, press cookie dough into 2-inch circles, 2 inches apart (9 cookies per baking sheet). Bake 8 minutes in preheated oven. 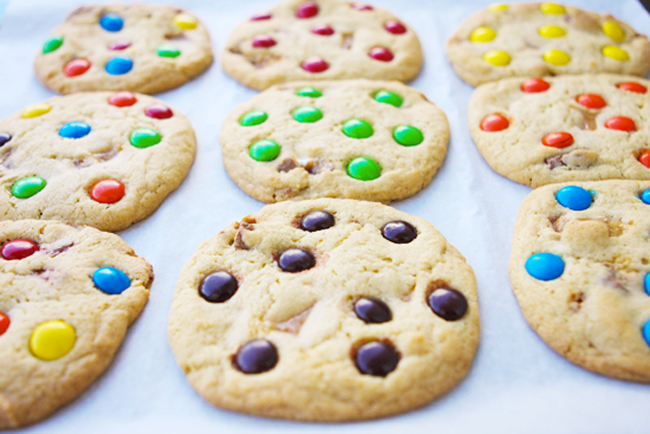 Remove from oven and press M&M’s onto cookies. Return to oven and bake for 8-9 more minutes. Remove from oven and let cool completely.